“Knowing that [stuttering] has biological causes and that three genes have been found is pretty exciting,” says Jane Fraser, president of the Stuttering Foundation of America. Her father, Malcolm Fraser, a successful businessman, started the foundation in 1947 because of his own struggles with stuttering. The initial “F” of his own name gave him particular problems. Kristin Chmela knows what she’s talking about. She’s worked a lifetime to overcome her own stuttering, and she can now, nearly all the time. She’s also a certified “fluency therapist” in Long Grove, Ill., who treats other people who stutter. If my grandparents were alive today, they would be happy to read Jane Fraser’s comment "Parents don't cause stuttering, and this research should lift the burden of guilt from their shoulders" and be assured that their parenting skills did not cause the stuttering in their sons. They would also be happy to know that the Stuttering Foundation helped their sons lead successful lives because of their book “Self Therapy for the Stutterer” and referral of one of the sons to a speech therapist trained to work with stuttering. Thanks to the Stuttering Foundation for supporting Dr. Drayna’s work! 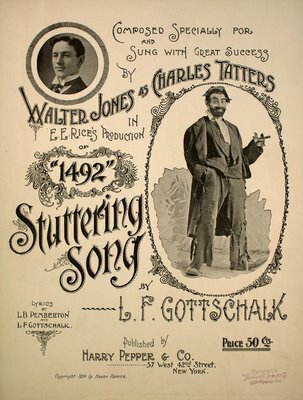 I have read that singing a phrase can overcome stuttering. Is that true? anyone know? If so, how does that combine with what this article says?